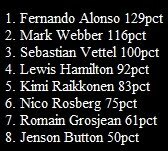 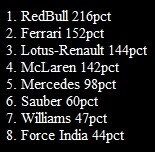 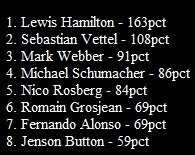 At the start of 2010 Formula 1 competion i said that this year will be dominated by Red Bull cars and i was right:) so far.. 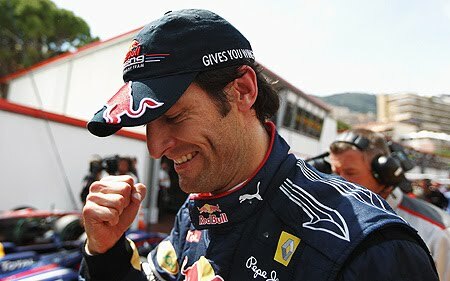 So, at Monaco we attended at one of incredible victory of Webber, same as the race before, in Spain, and we remebered how Schumacher won a lot of races like that in the past, Vettel overtakes Kubica in first corner and folowed Webber in this Red Bull victory, Alonso very spectacular(from last place to sixth), Scumacher overtakes Alonso in the last corner of the last lap of the race and Massa and Hamilton just have not taken any impotant risks. 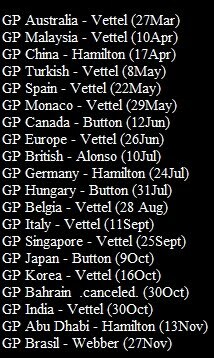 Many crashes and mecanic failures at this Grand Prix: Jenson Button - exploded clutch, Barichello and Hulkenberg (both from Williams)- crashed, Trulli and Chandhok tangle at Rascasse curve and crashed and other mecanic failures : Timo Glock, Lucas di Grassi, Pedro de la Rosa and Kamui Kobayashi.